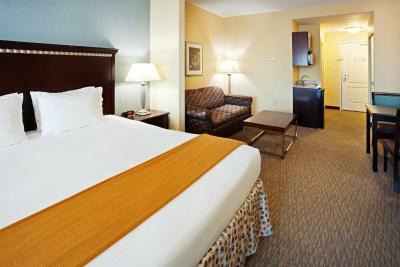 Lock in a great price for Holiday Inn Express Hotel & Suites Smyrna-Nashville Area – rated 8.5 by recent guests! Really good room for the price and free breakfast! Comfy bed. Very clean. Room was very convenient to elevators, laundry, pool etc, great for elderly guest. Good breakfast. Staff polite and friendly. The breakfast was hot and the omlettes were so yummy! The bed was great. Especially for my husband who has a bad back. It was perfect. We went for a blues concert. The room was spacious, clean and I’m very picky about hotels but this one was super clean, even the bathrooms! I’ll definitely stay here again next time I’m in town. Good Location. The staff recommended a Mexican restaurant that was great. Standard Holiday Inn Express. Most Holiday Inn Express hotels have the same standard breakfast. You know what to expect out of Holiday Inn Express if you’ve stayed at one before. Holiday Inn Express as a brand is the kind of hotel 90% of people would like. This chain of hotels has WiFi, continental breakfast, microwaves, clean quiet rooms, a business center and sometimes mini fridges. If the roach motel is an old worn out economy car and the Five Star Hotel is a Bentley then the Holiday Inn Express is a mainstream well equipped SUV. As long as the GM takes care of the hotel, brand it self is good. Go ahead and book it. The staff here is tremendous. We asked about if we could buy their cinnamon rolls somewhere and she gave us the Holliday Inn website. We thanked her and as we were getting on the elevator she brought us a whole tray to take home. Will definitely stay here again. I have been telling everyone I meet what a great friendly place to stay. They know how to shop for pillows! Comfy bed, and GREAT pillows! 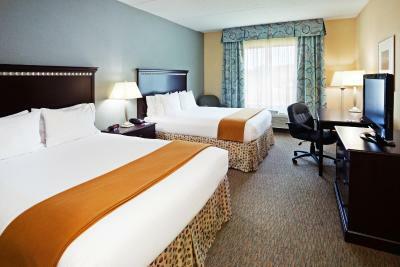 Holiday Inn Express Hotel & Suites Smyrna-Nashville Area This rating is a reflection of how the property compares to the industry standard when it comes to price, facilities and services available. It's based on a self-evaluation by the property. Use this rating to help choose your stay! Located just off I-24 and less than 4 miles from downtown Smyrna, this Holiday Inn Express features a spacious, indoor heated pool and a whirlpool. Free Wi-Fi is available. The Holiday Inn Express Hotel & Suites Smyrna-Nashville Area offers rooms decorated in earth tones and equipped with a flat-screen satellite TV. An in-room coffee maker and ironing facilities are included. A hot breakfast buffet is served each morning, including cinnamon rolls and coffee. A free newspaper is delivered to guest rooms every day. Guests of the Smyrna-Nashville Holiday Inn have access to a fitness room with a TV and wall-length mirror. An on-site business center offers a public use computer, fax and copy services. 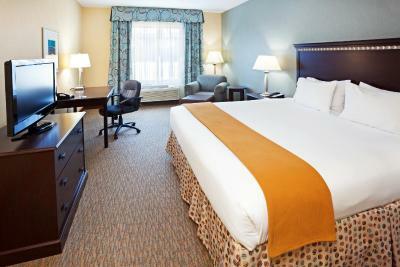 The Smyrna Holiday Inn Express Hotel & Suites is 4 miles from the Smyrna Golf Course and Recreation Park. Downtown Nashville is 25 minutes away. 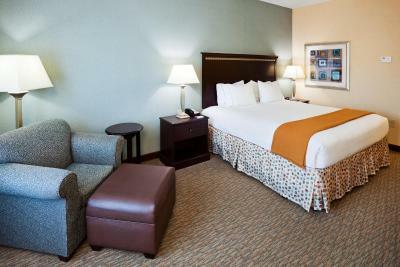 When would you like to stay at Holiday Inn Express Hotel & Suites Smyrna-Nashville Area? This double room has a tile/marble floor, air conditioning and satellite TV. This quadruple room has a seating area, tile/marble floor and air conditioning. Suite features a microwave, refrigerator and sofa bed. Room is wheelchair accessible and features a roll-in shower. Suite is wheelchair accessible. Includes a microwave and a refrigerator. 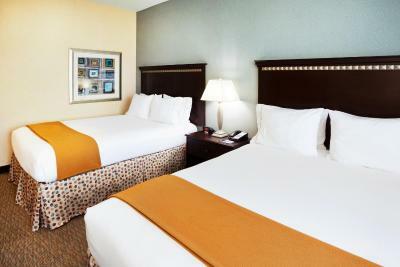 House Rules Holiday Inn Express Hotel & Suites Smyrna-Nashville Area takes special requests – add in the next step! Holiday Inn Express Hotel &amp; Suites Smyrna-Nashville Area accepts these cards and reserves the right to temporarily hold an amount prior to arrival. Holiday Inn Express Hotel & Suites Smyrna-Nashville Area accepts these cards and reserves the right to temporarily hold an amount prior to arrival. My tv and one of my lamps didn’t work, I only stayed one night so not a big deal. They were also doing construction so the lobby was kind of messy. This hotel is under construction and not worth the cost. I had no hot water in the morning so I had a cold shower. I called the front desk and she gave me $50 off my room. Right off the highway. Breakfast was awesome! Gym was empty no machines pool and hot tub was brownish color u had to enter threw a back door for check in my child caught the flu from hotel not being properly clean. The blinds in room was see through . The guest were loud an inconsiderate. They were loitering and being very loud in disruptive in the hallway. Renovation going on. Had i known I would not have booked. Dusty, loud with maintenance men, drills, etc. Multiple police called on the property early morning. Breakfast temp room set up right next door- loud when your trying to sleep. Was not a good night/ morning.. Very disappointing. I spoke to the receptionist and canceled our rooms for our April visit. Cant go through this again. Multiple hotels in same area cheaper and not under renovation.. Kids were running up and down the hallway and going up and down the elevator all night long! Couldn’t sleep that good! Large room with king bed. Large bathroom, clean and nice appointments. Easy access to elevator. Good breakfast. Really liked having a Keurig coffee machine in the room. We were 3 people in suite 214 for 2 days. There are 2 beds and a sofa bed. We had to make the sofa bed ourselves and it was not made up the next day when the beds were. Coffee maker broken. Pool room cold. Tub shower has only 1 grab bar. Noisy heater.